An in floor subwoofer is a great way to provide serious bass levels to your audio system without compromising the aesthetic of the room. Floor standing subwoofers are great, but interior designers and homeowners alike commonly ask, “Do I really need a subwoofer? I’d rather not have such a large speaker just sitting in the room.” The answer is yes, if proper surround sound is the goal then a subwoofer is necessary. It doesn’t have to sit in the middle of the room though; it could be hidden in the floor. An in floor sub is the solution that both audio enthusiasts and interior designers are happy with. In floor subwoofers are used when the presence of a floor standing subwoofer would be considered unsightly, but the goal of high quality audio is not to be compromised. This is most commonly the case in surround sound systems, which always require a subwoofer. 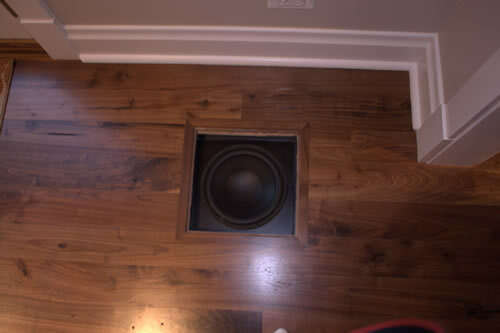 In a room where the rest of the speakers are either within bookshelves, the wall, or the ceiling, the subwoofer is generally the last component that needs to be hidden, in which case an in floor subwoofer becomes necessary. This could also be true in stereo audio zones where there is a conflict of interest between family members, in which one would prioritize audio over aesthetic, but the other would prioritize aesthetic over audio. In floor subwoofers are preferable to in wall subs in terms of sound quality. This is because in wall subwoofers are generally designed to be only 4″ in depth, which is a severe limitation on the depth of the speaker and also the air volume of the enclosure (if it’s even a sealed enclosure at all). Not only that, but drywall isn’t exactly a rigid stucture. It’s very common for the vibration of an in wall subwoofer to carry into the drywall which will cause a lot of excrutiatingly annoying unwanted noise. In floor subwoofers are generally 3-4 times as deep as in-wall subwoofers, allowing for a much deeper speaker and a lot more air volume. 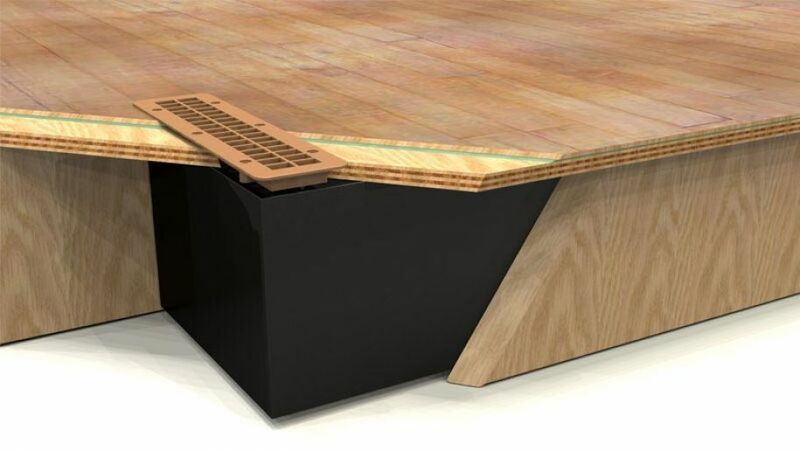 Since the floor is very rigid, it also avoids creating unwanted noise from vibration of surrounding materials. We prefer the 12″ in floor subs in the UTF series from Next Level Acoustics. These are premium grade in floor subs made with no compromise, and can even be customized to suit individual taste. These subs are a great value because they offer an experience you can’t buy in a big box store, but at a price that’s still inline with the rest of the market. Specifications for each subwoofer are in following table. Voice Coil 8 Ohm - 1.7"
Voice Coil 8 Ohm - 2"
Voice Coil 4 Ohms - 3"
The least expensive option that is still viable is the Polk Audio CSW100. This is an in floor model with a similar enclosure to the Next Level Acoustics product. It uses a 10″ speaker that is capable of handling 250W RMS, and the cone is is a polymer composite. It has a frequency response of 33-120Hz. It also comes with a prefabbed grill, which is useful if it’s a retrofit installation. Choosing an in floor subwoofer is a balancing act between budget, frequency response, and power. What size sub do I need? It is recommended to start the selection process by first narrowing in on a speaker size. Speaker size is going to be largely dependent on usage. 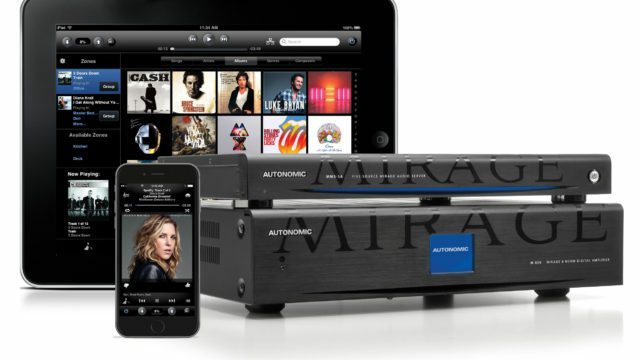 If the infloor sub is going to be in a stereo audio zone where the purpose of the audio system is only music listening, a 10″ speaker may outperform a 12″. This is only true if the full range speakers are small and crossovers will need to be set above 80Hz. A 10″ speaker will inherently be lighter, which becomes more important as the higher end frequency is raised. Surface area can be spared in exchange for those crisp lower mid bass hits. However, bear in mind that when it comes to infloor subwoofers the 10″ models general handle much less power than their 12″ counter parts, and that when using a 10″ in floor subwoofer it’s more likely that you’ll need to use more than one. In surround sound systems, the most common use, the subwoofers will be used for the LFE (low frequency extension) of the sound mix. Most surround sound speakers are designed for crossovers to be set at 80Hz, meaning that the in floor subwoofer will only be responsible for the lowest frequencie (tones). In this case, the bigger the subwoofer the better. A larger surface area will allow lower frequencies to be hit more efficiently, and this combined with power are what delivers bass that you can feel within your chest. For this reason, a 12″ speaker is always recommended for use in surround sound systems. To summarize, in rooms where stereo music listening is the primary activity and crossovers will be set above 80Hz, a 10″ in floor subwoofer is recomended. 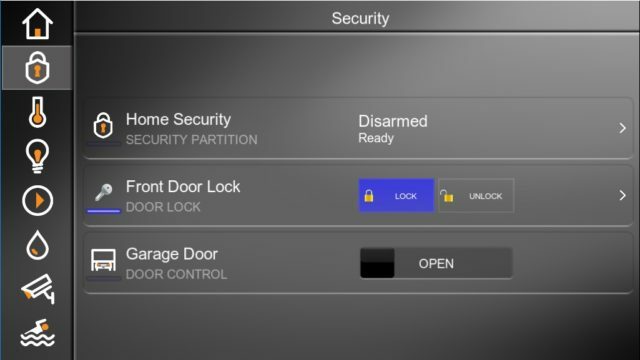 The Polk CSW100 or the Next Level Acoustics CI-UTF 10 are recommended in this situation, and the Next Level Acoustics product is the preference over the CSW100 because of the presumably lighter (kevlar) cone material. In rooms with surround sound, a 12″ in floor subwoofer is recommended. 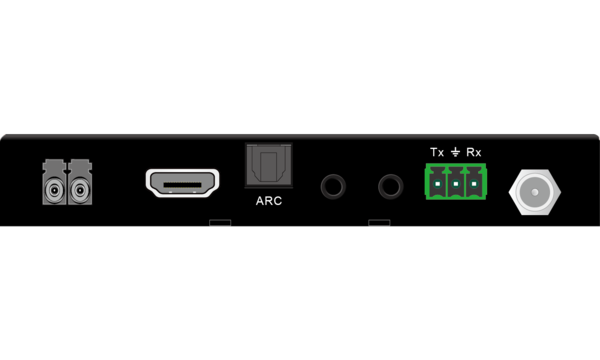 The choice between the Next Level Acoustics CI-UTF 12 and the CI-UTF 12LE will be based on power. How much power do I need for an infloor subwoofer? Recommended power is largely dependent on room charactaristics, and we’ll focus on surround systems because that is the most common use case. A small room (10’x12′) with 4 walls is going to require the least amount of power. 350-500W should deliver bass that can be felt while still keeping clean. This fits nicely with either the CI-UTF 12 or CI-UTF 12LE in floor subwoofers. A larger room with 4 walls, or a smaller room with only 3 walls would need between 500-750W of power for the bass to felt. This would require at minimum one CI-UTF 12LE or two CI-UTF 12 in floor subwoofers. If the room has only 3 walls, then two CI-UTF 12 subwoofers would be a better than single CI-UTF 12LE because it would feel more balanced. Rooms with only 2 walls, or very large spaces are going to require at minimum 750W, but the real recommendation would be to use at least 1000W. This is a situation where two in floor subwoofers are necessary, and the recommendation would be to use two CI-UTF 12LE’s to achieve bass that can be felt while still acheiving even frequency distribution at all listening positions. It’s important to always error on the side of too much power than too little. Even if the normal volume level of the in floor sub will not utilize all of the power, it’s important to allocate for dynamic range. If a speaker is playing casually at it’s highest power level, it will have nothing extra left to give when the extra power is needed immediately. If no headroom power is allocated then super intense secenes in a movie might just super sloppy if the speaker reaches max power before it should. The only way to rectify this would be to lower the level of the in floor sub in it’s entirety, which might mean missing power goals. When choosing an amplifier, it’s important to either meet or exceed the power level of the in floor subwoofer. Extra power can always be dealth with by attenuation. For example, if two CI-UTF 12LE subs are necessary, the amps should be sized for 1000W RMS, or more than one amp must be used. 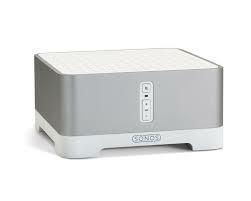 For a single or dual Polk Audio CSW100 the recommended amplifier is the Polk Audio SWA500. It was sized specifically for this sub and was designed to run either 1 or 2 subs depending on the application. Using the correct crossover card, it will always have the correct settings. Crossover cards are available for the CSW100 (in floor), CSW200 (in floor, discontinued), or the CSW155 (in wall). Next Level Acoustics offers a more custom product, so we’ll have to use a more customizable amplifier. The Sub A500 by Origin Acoustics would be the preffered option. Origin Acoustics subwoofer amplifiers offer a subsonic filter to cut sound below the frequency response of the sub to keep the sound clean. They also have a built in parametric EQ to provide extra output at a selectable frequency to allow fine tuning of those dramatic moments. In “Music” mode, they also offer a high pass filter with an adjustable aggressiveness of the crossover slope. Origin Acoustics makes a great amp, and the Sub A500 is the perfect fit for any our Next Level Acoustics in floor subwoofers. The Subamp A500 outputs 500W into an 8 Ohm Load, and 750W into a 4 Ohm load. This will be more than enough allows great flexibility for the recommended in floor subwoofer options. A single Origin Acoustics Sub A500 can provide enough power for up to two CI-UTF 10 or CI-UTF-12, or power for one CI-UTF 12LE. Two Sub A500’s are required for dual CI-UTF 12LE’s. The more budget friendly option would be to use a Crown CDI-1000. The Crown CDI-100 is typically though of as a commercial 70V amplifier, but it does have a low pass crossover, which is all we need to make it a subwoofer amplifier. With THD <.5%, it will fit our needs just fine. A single CDI-1000 can power any sub configuration, and can be had for $678. The higher quality, lower powered, specific use case design of the Origin Acoustics Sub A500 is preffered, but if it’s make or break for the budget of the installation or if it allows a more aggressive sub selection then the Crown CDI-1000 will work just fine. The subwoofers are mounted below the floor within the joist space. It is strongly encourage that there is a dropped ceiling or unfinished space below the in floor subwoofer for service reasons, but this isn’t absolutely necessary and they can be installed even if the room underneath has a finished drywall ceiling. If it is a new construction job a hole in the subfloor must be cut in the precise location of the subwoofer port. Be sure not to constrict any opening size by cutting the hole smaller than the opening of the port. The subwoofer can then be fastened below the subfloor to the adjacent joists. It should be forced snug to the subfloor enough to compress the foam padding between the in floor subwoofer and the subfloor significantly. The opening of the port should be covered with the cut subfloor as to prevent construction debris from falling into the port. 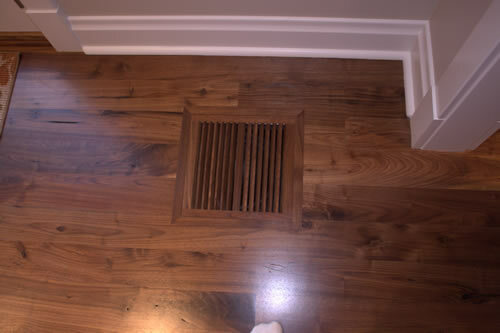 The flooring contractor will need to provide a register vent that is the same size or larger than the opening, and it should be stained the same color as the rest of the floor. The register vent should be installed so that is very secure and very tight. There is no reason for it to be removable, it may be glued, and of course don’t forget to remove the piece of wood that was blocking construction debris. In a retrofit, the same proceedure is followed, but the floor must be cut to the exact size of the floor register intended to be used. Speaker wiring of at least 14 AWG should be used for all in floor subwoofers. Commonly, 16/4 is used for whole home audio systems, and it is an acceptable practice to double up on 16/4 to feed the in floor subwoofer from the amplifier. 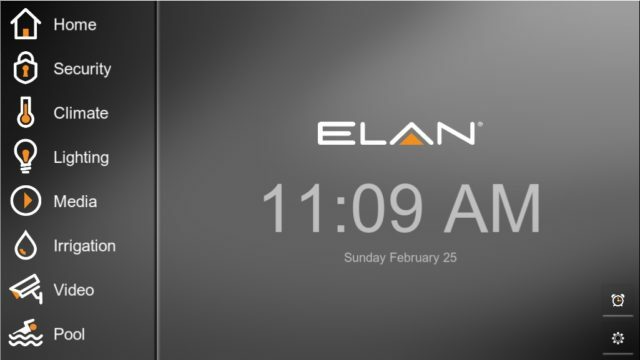 This would be about equivilent to using 13/2 and allows to do the prewire with materials on hand. Yes, you can walk on the resgister vent. No, don’t place it under a coffee table. Congrats! The subwoofer is now hidden, out of sight, and excellently engineered.